Galvanized by the political climate, a record number of women are running for public office, many for the first time. 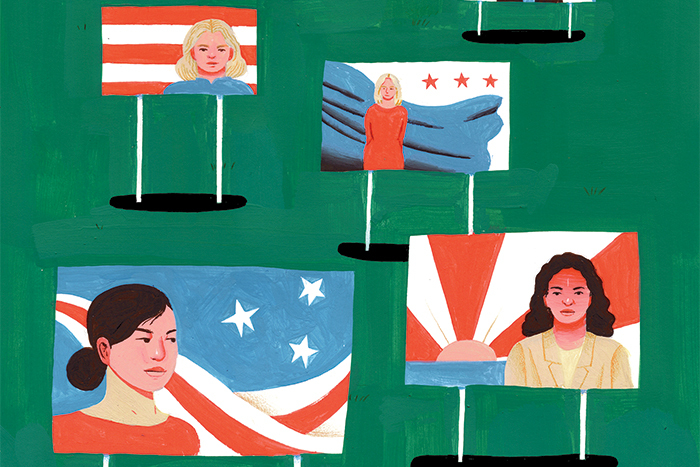 Their goal: ensure women's voices and issues are front and center in the national debate. Keiko Matsudo Orrall ’89 was the first Asian American woman to be elected to the Massachusetts House of Representatives. Now, with a message of fiscal restraint, she’s running as the Republican candidate for state treasurer. Orrall is one in a bumper crop of Smith alumnae vying for political office—from local school boards to statehouses—in a record-breaking year for female candidates. Nationwide, more than 600 women—the most ever—launched campaigns for the U.S. House, U.S. Senate or governor, according to the Center for American Women and Politics (CAWP) at Rutgers University. And like Orrall, women from both sides of the political aisle are overcoming their initial hesitancy as they learn to see themselves as leaders who are ready to face the heightened scrutiny that women candidates encounter. As is typical for midterm elections, the opposition party is particularly galvanized. But this election cycle stands out for the number of Democratic women, including many political novices, who are running. They are angered, they say, by destructive policies directed at reproductive rights, health care and gun violence. They are energized by the #MeToo movement and the massive women’s marches held as soon as President Trump took office. Some 340 Democratic women are running for seats in the U.S. House, surpassing the previous record of 190 in 2012. On the Republican side, 116 women filed to compete for House seats by June, compared to the peak of 128 Republican women entering House races in 2010. Roughly 67 percent of women running for Congress this year made it through their primaries or didn’t have a primary challenger. Some analysts are drawing comparisons to 1992, when a record number of women won seats in the U.S. House and four more women were elected to the U.S. Senate. One motivation for voters that year was Anita Hill’s treatment during confirmation hearings for Supreme Court Justice Clarence Thomas. 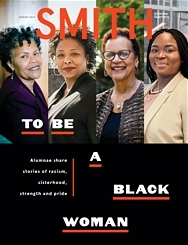 “The Anita Hill incident raised awareness about the kind of indignities that women are subjected to by a predominantly white male government that doesn’t take women’s concerns seriously,” says Carrie Baker, professor of the study of women and gender at Smith. Baker believes a similar dynamic is happening now, triggered by events from the Access Hollywood recording of President Trump to the rollback of civil rights protections. “One issue after another has been knocking the ground out from underneath women,” Baker says. “Women are seeing the impact that’s having, and they’re pissed. That’s creating a grassroots movement inspiring women to run for office.” Democratic voters are receptive. A re- cent NBC News/Wall Street Journal poll found nearly 90 percent of Democrats believe the country would be better off with more women in office; 49 percent of Republicans report feeling that way. 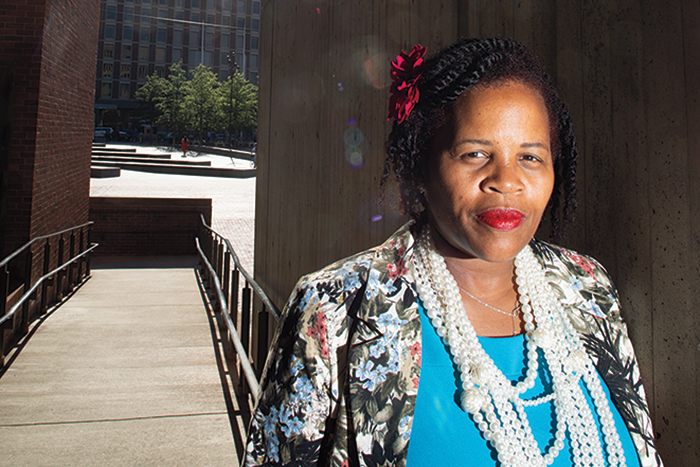 The state of national politics, along with a sense that her district in Boston was at a crossroads, also motivated community organizer Kim Janey AC ’98. “I needed to take my advocacy and my activism to the next level, so I could have a greater impact on the issues I was fighting for,” says Janey, who won a seat last November on the Boston City Council in her first political race. Her priorities include affordable housing and eliminating the opportunity and achievement gaps in public schools. Campaign manager Virginia Ramos Rios ’94, right, works the phone while Alexandria Ocasio-Cortez, candidate for U.S. representative, makes an appearance in Queens, New York. In the June primary, she defeated longtime incumbent Joseph Crowley. One of the most electrifying races for women came during the June primaries, when newcomer Alexandria Ocasio-Cortez unseated 10-term incumbent Joseph Crowley for a U.S. House seat in New York. 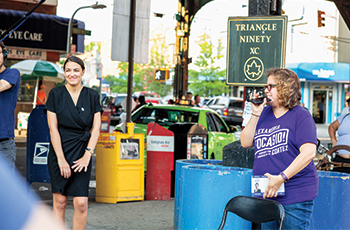 Observers said Ocasio-Cortez came out of nowhere, but in fact her insurgent, grassroots-style campaign was run by Virginia Ramos Rios ’94, a government major at Smith who had previously worked as an organizer for presidential candidate Bernie Sanders. “It has been exhilarating, exhausting and life changing,” Ramos Rios says. “It feels amazing to have been part of the team that showed our nation and the world that this is possible.” With the primary behind her, Ramos Rios is now focusing on an effort to register 20,000 voters before the general election. “Our goal,” she says, “is to establish a bottom-up way of doing politics. There’s no question women remain vastly underrepresented in state legislatures, governors’ mansions and Congress. In 2017, more than 80 percent of members of Congress were male. So would electing more women really make a difference? Congressional women say yes. A 2017 CAWP study based on interviews with women senators, representatives and delegates of the 114th Congress found that women in office are more collaborative than their male counterparts and more likely to work across party lines. The study says they see themselves as “more results-oriented, more likely to emphasize achievement over ego and more concerned about achieving policy outcomes rather than receiving publicity or credit.” Women of color also emphasized the importance of having an array of diverse perspectives in policymaking. Women officeholders, Lake notes, bring different priorities and experiences to the job. But to get elected, women have to overcome obstacles that men don’t face, according to research from the nonpartisan Barbara Lee Family Foundation. To get elected, a man doesn’t have to be seen as likable, while likability can make or break a woman’s candidacy. Similarly, voters don’t require men to prove they are qualified, but women must, the research says. 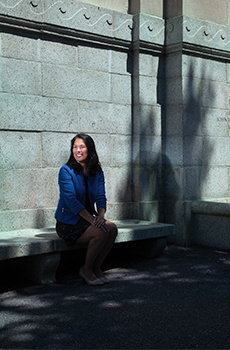 In her first run for political office, Kim Janey AC ’98 was elected last fall to the Boston City Council. The community organizer names her key issues as affordable housing and addressing the achievement gap in public schools. While there are cases of outright misogyny against women candidates, especially online, some attitudes that hold women back are more subtle. Take views on motherhood. A voter might find a male candidate more appealing if he’s a dad with young children, while the same voter may balk at electing a mom with young kids. Campaign advisers for Betsy Humphries Holland ’97, an executive with Turner Broadcasting and candidate for the Georgia House of Representatives, debated how much to highlight her role as the mother of a 6-year-old. They worried that even progressive voters might have “an unconscious expectation that women should wait until their children are grown be- fore pursuing politics,” Holland says. In the end, she decided not only to talk about her son but to bring him along as she knocked on doors. “My experience as a mom is a big component of what makes me an effective candidate. [It gives me] firsthand experience with public schools, searching for child care, navigating health care and saving for college. I’d rather highlight that than hide it.” One sign of progress for parents: The Federal Election Commission recently ruled that federal candidates may use campaign funds to pay for child care while running for office. Another Smith woman drawn to run for local office is Satya Rhodes-Conway ’94, candidate for mayor in Madison, Wisconsin, and former city council member there. Local government, she says, is where change can happen right now, especially when legislation stalls at the state or federal level. “Local governments can be laboratories of democracy,” she says. “We can try things at the local level. We can see if they work. And if they do work, they can be translated upward to state and federal governments.” Affordable housing, an issue that vexes many municipalities, is one of her top issues. If elected, Rhodes-Conway will be Madison’s second woman and first openly lesbian mayor. 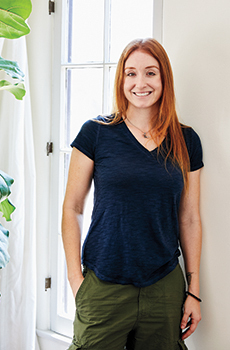 Jess Mencer Phoenix ’04 mounted an energetic campaign for California’s 25th district and focused on the need for climate research. She came up short in a crowded primary field and cites the fundraising challenges that women candidates face. The typical model for a Congressional race is “sitting in a windowless room for 10 to 12 hours a day and dialing rich people,” Phoenix says. “I rejected that pay-to-play model and said I’m going to run a grassroots campaign because that’s where I believe the future of politics is.” To that end, she says, Smith women need to support candidates they believe in. Even if women candidates are disproportionately successful this year, Congress will likely remain 75 percent male, cautions Smith professor Howard Gold. It will be a long time before we see parity at the national level, he says, because Congressional candidates are often recruited from the pool of state and local politicians, where women remain underrepresented. Still, with more women on the ballot at all levels this year, the pool of potential candidates is bound to grow. Andrea Cooper ’83 is a frequent contributor to the Smith Alumnae Quarterly.